Sandy Collora is a talented concept designer and artist who has worked on films like; Dogma, Men In Black , The Crow, Jurassic Park, Total Recall, Robocop 2, Predator 2, The Abyss, Nightmare On Elm Street 5, etc, etc. In his spare time he makes commercials and short films. If you haven't already, you should watch his short Batman: Dead End Even though it's a fan made short it has to be in the Top 4 Batman films ever. 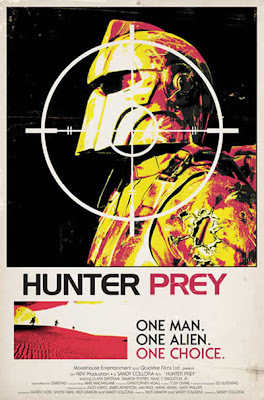 Collora's debut feature Hunter Prey will have it's UK premiere at the Sci-Fi-London 09 Film Festival on May Day. Uploaded by SFLTV. - Classic TV and last night's shows, online. In Hunter Prey a spaceship crashes on a desert planet. The alien prisoner the intergalactic commandos are transporting escapes and starts killing the survivors one by one, but they are under strict instructions to bring the prisoner in alive. This is the debut feature from concept designer and artist Sandy Collora, who is best known for the 2003 short Batman: Dead End, one of the best fan films ever made. Hunter Prey is a tense chase film with the great production design you’d expect, and nods to Star Wars, westerns and other genre classics.